The following is a quote from the wonderfully inspirational newly-released book House of Diamonds [Feldheim]. “Where is the best place in the world for spiritual connection for a woman? “If you entered ‘palpable spirituality” into your GPS, where would it lead you? “One might think that the Land of Israel is the ideal location for achieving closeness to Hashem. Wouldn’t any visitor feel a special thrill upon visiting the Western Wall? Aren’t the tears shed while praying at Rachel’s tomb a form of spiritual closeness? “Some may say that on Yom Kippur, standing in shul for Kol Nidrei, they feel spiritual inner peace. 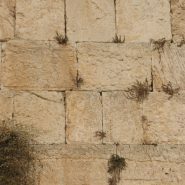 “But as women, we must know that for us the home is in a similar category as the Kotel. Missiles on Way to Wedding: "A Great Victory--Establishing a Jewish Home in Israel"
Now if we could just feel it as easily as we read it….. We know it to be true but don’t accept it. So other things take on more importance….